EDMONTON, California — The first — and to date only — interaction between the two fighters who presently share the record for most UFC title defenses was not a meeting of equals. The date was Feb. 6, 2011. The setting was the Mandalay Bay Events Center in Las Vegas. Silva, then reigning UFC middleweight champion, was reaching the height of his powers. He’d go out that night and add an iconic face-kick knockout of Vitor Belfort to his resume. Johnson? He was just another guy on the card. Johnson was making his UFC debut that night after a WEC stint, as he went out and scored a decision over Kid Yamamoto on the Facebook prelims. Silva by this time was already being name-checked on the short list of greatest UFC champions, but there was little indication Johnson’s win that evening would be the start of a 14-1-1 sprint through the UFC that would bring him into the conversation. 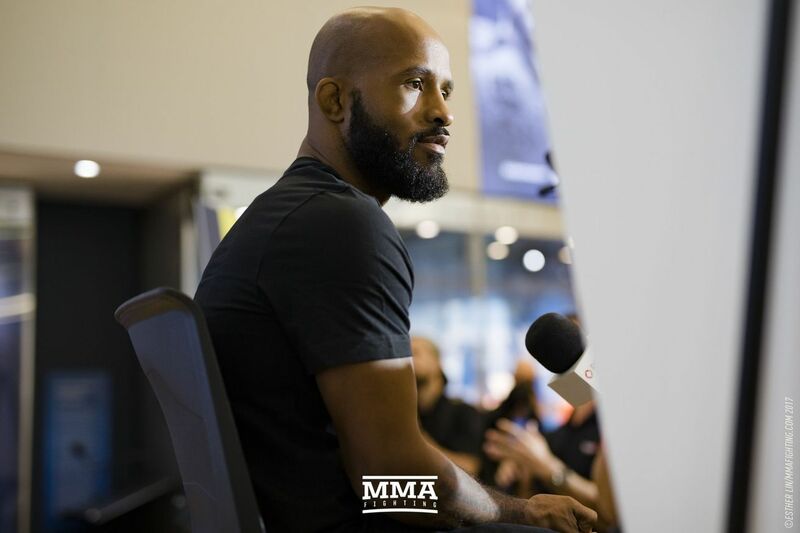 And as Johnson gets ready to make what would be his record-breaking 11th title defense against Ray Borg on Saturday night in the main event of UFC 215 at Rogers Place, he recalls that his meeting with Silva was brief. While Silva might not have treated Johnson as a peer back in the day, it’s clear today, the UFC roster holds the longest-reigning current champion in the highest of esteem. Should Johnson retain his belt, he’ll join just Silva, Georges St-Pierre, and Jose Aldo in the five-year UFC champions club. Someone like Rafael dos Anjos, who held the UFC lightweight title for more than a year, can appreciate Johnson’s accomplishments more than most. Johnson’s standard also gives current champions something to shoot for. UFC women’s bantamweight champion Amanda Nunes is looking to make the second defense of her title on Saturday night when she squares off against Valentina Shevchenko in the co-main event. The American Top Team Fighter says someday the record will be hers, but she recognizes what Johnson has done. GIlbert Melendez, as a two-time Strikeforce middleweight champion, also understands what it takes to stay on top. Melendez also dismissed the critics who have nitpicked Johnson on the way on everything from his drawing power to his caliber of competition. Ilir Latifi, too, believes that criticisms of the champ have been off the mark. The Swedish light heavyweight, who meets unbeaten Tyson Pedro on Saturday, says that even if some fans don’t give Johnson his due, those who actually step in the cage get it. Even the guy who will face Johnson in the cage on Saturday, Borg, isn’t about to front like he hates the longtime champ. Borg, of course, believes he’ll be the one who keeps Johnson stuck in a tie with Silva. But he also believes that defeating Johnson would make a title win all the more meaningful. As for Johnson, he’s not holding that early meeting with Silva against him. If anything, matching Silva’s record means he’s the only person alive who understands what Silva himself accomplished.